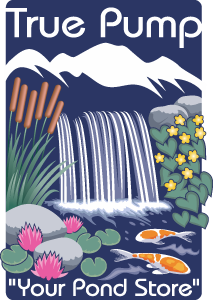 A Pondless® Waterfall allows you to experience the soothing sights and sounds of moving water with less maintenance and expense than The Ecosystem Pond. 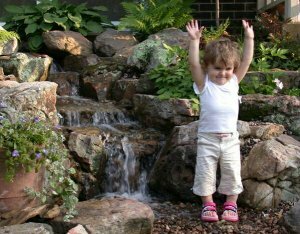 A Pondless® Waterfall is often the perfect water feature for front yards, smaller spaces, public areas or homes with small children. In a Pondless® Waterfall the pond and skimmer are replaced by a lined storage basin containing rock and a pump vault. This basin stores the necessary water required to operate the stream and waterfalls, yet no water is visible at the basin’s surface. An up-flow filter is still used at the top of the system which acts as a reservoir and a source to begin the stream and waterfalls. We recommend using AquaBlox® (modular water storage boxes) in the basin which allows you to decrease the basin size while increasing the storage capacity. Since there is no ecosystem to balance, the system is virtually maintenance-free and can even be run on a timer to save on electrical costs. Because there is no standing water the Pondless® Waterfall is safer than a pond which makes it the ideal water feature for public settings, front yards or homes with small children. As those children grow the basin can even be replaced with a pond at a later date to help educate them on how nature’s ecosystem works! Proper sizing of the storage basin is critical to a proper functioning Pondless® Waterfall! 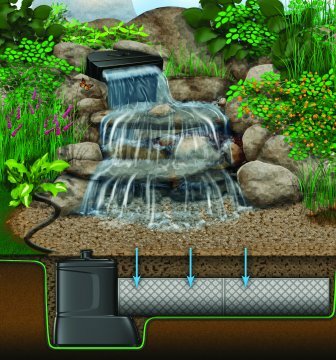 Call or email True Pump today and we can help you choose a Pondless® Waterfall kit or design a custom system for your individual application.